Xbox Live is at the heart of the Games hub. It carries over many features from the Xbox - from your avatar to your scores and achievements. The Spotlight feature is available too (it shows new stuff) and also Requests - which shows you game invites from your friends. Not all games support Xbox Live - the ones that do are in the corresponding section in the Marketplace. Compatibility issues are to be expected here as well. Reportedly, one out of four Xbox Live games will not run on 256MB of RAM and that's not as bad as some people may've feared. The basic mapping solution in Windows Phone is Bing Maps. They have driving (and pedestrian) navigation for free, but they're not a match for Nokia's bespoke applications (we'll discuss them in the next section). The Maps app uses a big font with white letters on black background that are easy to read. It still requires you to take your eyes off the road though, it won't put SatNav apps out of business. Normally, Windows Phone devices have a location-based service called Local Scout, which detects points of interest near you - restaurants, cafes, complete with user recommendations, reviews, etc. The feature is missing from the Lumia 610, due yet again to its hardware limitations. Being a lower-end offering than the Lumia 710, 800 and 900 one would think the Lumia 610 would miss out on the cool lifetime voice-guided navigation that Nokia WP smartphones are so proud of. But that's not the case - both Nokia Maps and, more importantly, Drive come preloaded. It takes the Nokia Lumia 610 about a minute to get GPS lock and you can make that even faster if you have a data connection for the A-GPS. Wi-Fi and Cell-ID positioning are also available if you only need a rough idea of your whereabouts. Nokia Maps is an alternative to Microsoft's Bing Maps. It lets you view maps in three different modes - map, satellite and public transport. You can use pinch zoom to navigate the map (you can also enable old-school zoom controls) and panning around is fast and smooth. Nokia Maps does only 2D mode - there's no 3D option like Google Maps has for example. It pulls its maps from the Internet, so you'll need an Internet connection to use it. Yes, even if you have downloaded offline maps for Nokia Drive (which we found to be weird). Moving on to the more interesting part of the duo, the Nokia Drive, unlike Maps, lets you easily download maps for offline usage for any country in the world - free of charge, of course. Bigger countries are split into pieces, if you don't want to waste your limited internal memory with maps you'll never need. Maps aren't that big - the map for the whole of the US is 1.9GB, while the map for the entire UK, for example, is 274MB. The 8GB of built-in memory is more than enough for any trip you're likely to take. It's easy to delete unneeded maps or download new ones on the go wherever there is Wi-Fi. Nokia Drive can operate in Offline mode too, which is a must-have feature. Drive does support a 3D view, unlike Maps. It also has 3D landmarks for some of the bigger world cities. You can also use 2D mode if that's what you prefer, but in 3D you get to see further down the road than in 2D. Other than 2D/3D, settings are pretty scarce - you can toggle daylight and night color schemes, choose whether landmarks should be displayed and choose a voice for the navigation. Many voices in a number of languages are available for free download. We were hoping for options to fine-tune the routing algorithm - like avoid toll roads, find fastest or shortest route and so on - but there were none to be had. You just set your destination (with an option to review the planned route before you go), hit start and you're off. While navigating, you can zoom in and out depending on your preference to see more of the road ahead or more details. At the top of the screen is an instruction for the next turn in big, easy to read white on blue letters and a big icon noting the turn. At the bottom of the screen you have the time remaining and current speed. Those get pushed to the left side of the screen in portrait mode. We like Nokia Drive's no-distraction's approach to navigation, but we are used to having more control over how the route is planned. A few other options would have been welcome too (the Symbian version of Nokia's SatNav solution is very feature-rich). 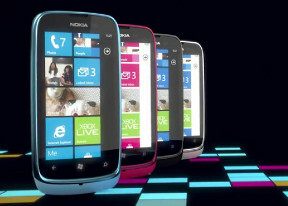 Still, the Lumia 610 beats all non-Nokia Windows Phone handsets on the market. The free voice-guided navigation might be just what it takes to convince people to go for the cheaper Lumia 610, instead of competing WP phones - at least in that price range. The Nokia Maps and Nokia Drive are the two apps that take longest to launch. The 256MB of RAM were never as painfully evident in the entire interface. The Nokia Drive takes close to 30 seconds to fully load. It goes on fairly smooth from then and we think most people should be able to forgive a budget smartphone for testing their patience.